Very occasionally, the lawn in my garden will grow mushrooms. My mate Reg, who knows about such things, swears that they are perfectly edible. I’m uber-cautious on such things. I love wild mushrooms, but am also respectful of how extremely unpleasant it can be to end up with the wrong kind. 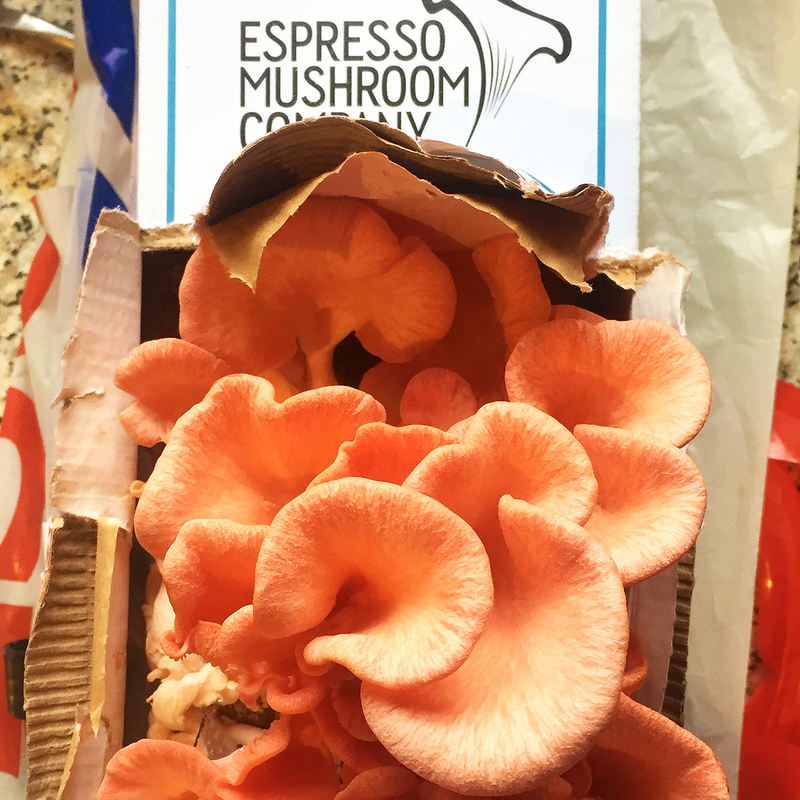 So at least one of my Christmas presents gave me the perfect opportunity to indulge my love of fresh fungi without such qualms - which was a Kitchen Garden box to grow your own hot pink mushrooms from the Espresso Mushroom Company. The company is a great venture founded on some good sustainability principles. Take somebody else’s waste (coffee grounds) and use it as your primary raw material (mushroom compost). They grow their own mushrooms, but then enable you to share the experience by buying these Kitchen Garden boxes where you get to do the same process in your own home. Cut a hole in the bag of coffee grounds and immerse it in water overnight. Allow it to drain, and then replace the bag back into the box and twice a day, spray the opening with water to keep it moist. The box has to be kept in relative warm - 10ºC or above. Watch the mushrooms grow, which they do pretty quickly. Harvest the mushrooms, cook and enjoy. If you’re lucky (I wasn’t) you may get a second crop of mushrooms, maybe even a third. Once it’s done, if you have a compost heap (I do) coffee grounds are a perfectly fine addition for it, so that even having been productively used twice, the coffee grounds still get to do one more useful thing and don’t end up in a landfill site. That part is, however, up to you. The process worked wonderfully. 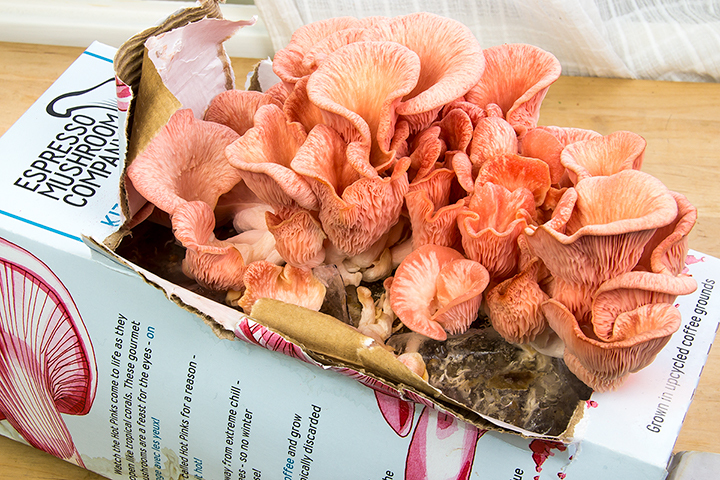 The mushrooms were dramatic and pink (although they do lose the pink colour through cooking). All the photos the company provides shows people growing the mushrooms with the box upright, so the mushrooms are sprouting out of the side. Mine was flat - it didn’t seem to make any difference. They require longer cooking than many of the mushrooms you might get. A slightly lower heat for something like 20 minutes gets the results - but they are tasty as anything, and well worth the time. If you do only get one crop, then it’s an expensive way to get some wild mushrooms to be fair (but then the enjoyment comes from the growing, not just the eating). The crop here did for four meals, so that’s not too bad. And if you get yours home and follow the instructions but find you don’t get the crop you were hoping for, the company guarantees its packs and will replace your duff one without quibble. I ended up including the hot pink mushrooms with chicken, fondant potato, spinach and sweetcorn purée, and then separately with a dish of red mullet, spinach and crushed potatoes with Caesar dressing. Both times, the mushrooms were a welcome, meaty and nicely textured addition to the dish. How I wish you could get these and they would grow Morel mushrooms! Those are the ones that I’m always craving come April/May time, but can rarely find (and cost a fortune when you do - to be honest £17.50 a box would be good value if you got four meals worth of Morels out of it!). But there you go - wild mushrooms are tricky beasts and many varieties will not thrive in the coffee-ground environment. If you have a foodie in your life and you’re stuck for present, the Kitchen Garden boxes are ideal. If you just fancy an occasional crop of nice mushrooms and would enjoy the grow-it-yourself experience, then give it a go.